Deservedly or not we're thought of by many people as squishy compromisers, groups more than willing to trim our understanding of Scripture to match the prevailing winds. Plus the fact that it was a cooperative effort among so many publishing concerns raised the specter of a "consensus" translation designed to please everybody and offend no one. What if this "mainline" Bible turned out to be a monument to committee-speak, politically correct platitudes, and radical scholarship? But any trepidation I had didn't last long, particularly as the names of the translators became known: James Charlesworth, Luke Timothy Johnson, Gail O'Day, Tremper Longman, Beverly Gaventa, and on and on the list goes. These are heavy hitters, scholars you know are going to produce a rock-solid, accurate translation based on the best available scholarship. The overall editors -- David Peterson (Old Testament), Joel Green (New Testament), and David deSilva (Apocrypha) -- are just as impressive. Now the New Testament has been issued and thanks to a marketing survey I took back in 2009 an advance free copy recently arrived in the mail. I've been reading through it for the past few weeks. 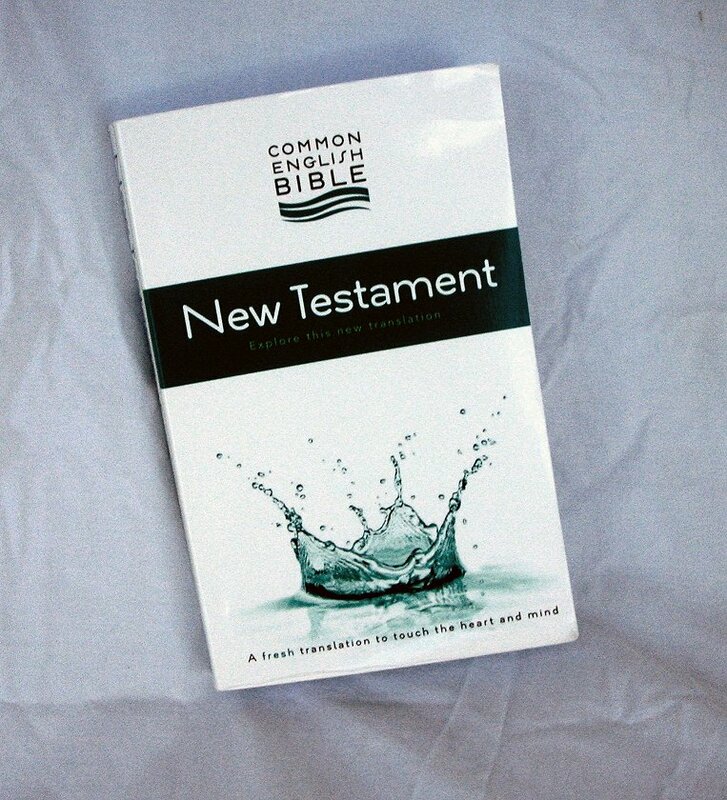 The Common English Bible is translated at a reading level (about 7th grade) that aims it directly at the vast majority of English speakers -- hence the name "Common English." Since the late 1960's a lot of other translations have tried to do the same, generally using a procedure called "dynamic equivalence." In dynamic equivalence, scholars don't translate word for word (which is called "formal equivalence"), like the old King James and other versions. Instead they ask themselves, "How would the author have said this if they were writing in English?" This can produce a very easy to read translation but the downside is that strict accuracy is often lost in the process. You get only an approximate Bible, but one that's fun to read. 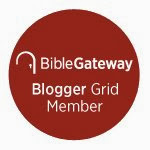 Like some other recent translations, the Common English Bible tries to avoid this by using a hybrid of dynamic and formal equivalence to produce a rendering that is both closely accurate and easy to read. And to a large extent they've succeeded. 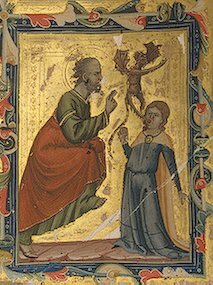 In the Acts of the Apostles for instance, chapter 16, verse 17, a slave girl possessed by a fortune-telling spirit keeps chasing St. Paul and his companions around, yelling at them. What she yells is usually translated (in the New International Version, for instance) as the rather positive statement, "These men are servants of the Most High God, who are telling you the way to be saved." But actually that's not quite what she says. "The" is not in the original Greek and that makes a big difference: It makes Paul's "way of salvation" just one among many. The CEB gets it right: “These people are servants of the Most High God! They are proclaiming a way of salvation to you!" And along with this accuracy goes a rather winsome style. The story continues in the CEB, "This annoyed Paul so much that he finally turned and said to the spirit, “In the name of Jesus Christ, I command you to leave her!” It left her at that very moment." This is so much more immediate than, say, the English Standard Version's, "Paul, having become greatly annoyed, turned and said to the spirit..." or even the New Jerusalem Bible's, "Paul was exasperated and turned round and said to the spirit..." "This annoyed Paul so much," is exactly how people today would tell that story. A more significant example of the CEB's accuracy can be found in Paul's Letter to the Galatians, chapter 3, verse 28. Here, in many Bibles, we find a bad translation that goes all the way back to the venerable King James Version, which renders it as, "There is neither Jew nor Greek, there is neither bond nor free, there is neither male nor female: for ye are all one in Christ Jesus." 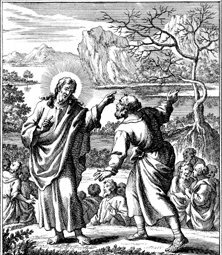 Down through the years many other Bible translations followed suit and numerous careless theologians and preachers have insisted that what St. Paul taught here is that in Christ, "there is neither male nor female." The New International Version, and Today's New International Version, the New King James Version, Revised Standard Version, New Jerusalem Bible, God's Word version, Good News Bible, Contemporary English Bible, Holman Christian Standard Bible and many others translate it this way. But that's not what it says, and the CEB gets it right: "There is neither Jew nor Greek; there is neither slave nor free; nor is there male and female, for you are all one in Christ Jesus." Why is this important? Because, as the scholar N T Wright points out, "'Neither male nor female'... is precisely what Paul does not say; and as it’s what we expect he’s going to say, we should note quite carefully what he has said instead, since he presumably means to make a point by doing so, a point which is missed when the translation is flattened out as in that version." Paul is almost certainly harking back to the 1st chapter and 27th verse of the Book of Genesis, where God creates humans "male and female" -- from which you may draw your own theological conclusions. I also point this example out because it's exactly the sort of verse where the politically correct mainline bogyman I mentioned above could have crept into the CEB, but didn't. And Romans chapter 10 verse 4 ("Christ is the goal of the law..."). The Book of Revelation, chapter 1 verse 10, is an expanded translation that is actually more accurate to most readers than the spare original. Many Bibles read, "I was in the spirit on the Lord's Day," but the CEB clarifies the meaning based on the other uses of "in the spirit" in this book: "I was in a Spirit-inspired trance on the Lord’s day..."
There's not an arresting new rendering every minute, but it does read very easily. And every so often you run into a punchy little phrase like, "Isaiah really knew what he was talking about when he prophesied about you..." This isn't The Message, after all. The Common English Bible is trying something much more difficult than a mere paraphrase: To express the exactness of a formal translation in the language of ordinary people. 13So did something good bring death to me? Absolutely not! But sin caused my death through something good so that sin would be exposed as sin. That way sin would become even more thoroughly sinful through the commandment. 14We know that the Law is spiritual, but I’m made of flesh and blood, and I’m sold as a slave to sin. 15I don’t know what I’m doing, because I don’t do what I want to do. Instead, I do the thing that I hate. 16But if I’m doing the thing that I don’t want to do, I’m agreeing that the Law is right. 17 But now I’m not the one doing it anymore. Instead, it’s sin that lives in me. 18I know that good doesn’t live in me—that is, in my body. The desire to do good is inside of me, but I can’t do it. 19I don’t do the good that I want to do, but I do the evil that I don’t want to do. 20But if I do the very thing that I don’t want to do, then I’m not the one doing it anymore. Instead, it is sin that lives in me that is doing it. There are still a few "do's" but by using a plainer brand of English the CEB translators make it easier to find your way through St. Paul's inspired verbiage. And they do it while holding on to accuracy. The CEB is not the holy grail of Bible translations though, and it has its share of poor renderings. One passage they muck up is found in Mark chapter 11. Mark is an intense, immediate writer and in verse 24 he is making one of his typically between-the-eyes assertions about faith. The New Revised Standard Version translates it correctly: "So I tell you, whatever you ask for in prayer, believe that you have received it, and it will be yours." The word translated "received" is a Greek part of speech called a "second aorist," which just means it's something that's finished, that's already happened. Although it's not quite the same thing as our past tense, it's so close that second aorists are almost always translated as past. Jesus is saying your faith should be so vivid, so real, that when you ask God for something you know he has already given it to you. Insisting on a faith that tangible can be a scary thought though; it's much easier to put the prospect of your prayers being answered somewhere in the sweet by-and-by (then it won't look so bad if what you prayed for doesn't happen). That's what the Common English Bible seems to be doing here when they translate this verse, "Therefore I say to you, whatever you pray and ask for, believe that you will receive it, and it will be so for you." "Will be so for you" is rather fluffy too; it sounds as though the answer to your faith will be only a relative, subjective thing. St. Mark's Greek is much more definite. The NRSV we quoted above has it perfectly: "It will be yours." Given the general level of accuracy in the CEB I was a little let down to see their rendering of chapter 1 verse 21 in the Second Letter of Peter. -- "Men and women led by the Holy Spirit spoke from God." The Greek here means "to be carried," even in some cases to be blown along like a sailing ship in the wind. "Led" isn't really wrong, it's just rather generic and bland. A translation I didn't like at first but has wormed its way into my heart is found in the First Letter of John, chapter 3, verse 9: "Those born from God don’t practice sin because God’s DNA remains in them. " "God's DNA?" It's grown on me though. What John actually says here is "God's seed," or more colorfully "God's sperm." John is the only writer in the New Testament to use that rather daring picture of our relationship to God. He's plainly trying to get our attention and "God's DNA" certainly does that. Still, it seems to me that "DNA," totally unknown in the 1st century of course, crosses the line from translation to paraphrase. I certainly plan to use "God's DNA" in teaching and discussing Christ's message from now on (and if that doesn't get their attention I'll use "God's sperm"). But something more at home in St. John's time period seems to be called for here. Now we come to what I regard as perhaps the major lapse in judgement in the Common English Bible. I know what they were trying to do here and certainly commend them for the attempt, but if there is anything in this translation that smacks of the squishy, ecclesiastical-sounding, committee-speak I mentioned at the beginning of this article, it's Jesus calling himself, "the Human One." Just a bit of background: "the Human One" is the CEB attempt at a fresh translation of the term "Son of Man" when Jesus of Nazareth uses it of himself. "Son of man" is really just the Hebrew way of saying "a human." "Sons of the Prophets" were the students of a prophet (First Book of Kings, chapter 20, verse 35), and the "sons of Israel" were Israelites (Book of Exodus, chapter 13 verse 19). A "son of man" was just a human. You will find the prophet Ezekiel being addressed as "son of man" repeatedly by God in his book (Book of Ezekiel, beginning in chapter 2 verse 1). So it makes sense for a translation like the CEB to translate "son of man" with the much more natural term, "human." But then, in an awesome vision witnessed by the prophet Daniel, "one like a son of man" appeared and was presented before God himself -- the "Ancient of Days," (Book of Daniel, chapter 7 verse 13). This "son of man" is obviously no ordinary human, and many at the time of Jesus saw this as a prophecy of the Messiah. Jesus took up this name "Son of Man" and used it of himself throughout his career. No one else in the entire New Testament is called "Son of Man" and outside the Gospels no one calls Jesus "Son of Man" with the single exception of Stephen, the first martyr of the Christian movement (Acts of the Apostles, chapter 7 verse 56). Most scholars believe "Son of Man" was Jesus' chosen term to represent what he saw as his mission as God's Messiah. Plainly something more than just "human" is needed to translate "Son of Man" when Jesus uses it to refer to himself. It must be something that encapsulates the original meaning of just a regular human being, the celestial being seen by Daniel, and the messianic implications many saw in this term in Jesus' day. To do this, the CEB translators chose "The Human One." But this rendering fails on at least two fronts. First, "the Human One," by nature of the very words used, over-emphasizes the human aspect of this title as it is used by Jesus. In the early 1st century no one thought of Messiah as being God, and only a very few thought of him as in any sense a supernatural being, like an angel. The Messiah most Jews expected was a King and warrior who would expel the Romans and set up God's Kingdom. In other words, there was no need for Jesus to emphasize his human-ness; it was assumed by virtually everyone. Looking back from our 21st century vantage point where we perhaps recite the assertion each Sunday that Jesus was "God of God, Light of Light, True God of True God," it may seem very important to stress his sheer humanity. But that wasn't the main issue when Jesus was walking the dusty trails of Galilee calling himself "Son of Man." Translating that into "the Human One" makes it all about that. The CEB translators attempt to include the other aspects of meaning by capitalizing this phrase. But that only suceeds in making "the Human One" seem magisterial and grandiose -- traits Jesus, "gentle, lowly in heart," friend of fishermen and babies, was never accused of displaying. Which leads to the second problem with this rendering: It displays a tin ear. So much of the Common English Bible is fluent, natural, and even fun to read; "the Human One" has that committee-designed, consensus-building, church-speak sound you frequently hear in final study documents issued by central denominational steering committees. It's a phrase that sounds tailor-made to provoke the response when read, "Why yes, he was one of us, wasn't he? And isn't that a sweet, sweet thought." Appearing as it does surrounded by so much natural sounding prose, "the Human One" is rather jarring -- particularly since it's repeated so often throughout the Gospels. I would also point out that other "Son of..." phrases are not singled out for this type of translation. "Son of God," for instance, does not become "The Divine One." I'm not sure there is a totally satisfying alternative to "Son of Man" when it's used as a title for Jesus. "Son of Man" itself may still be the best choice for what are probably some of the same reasons "Son of God" was not dallied with. "Son of Man" is already charged with the requisite meaning through dint of usage, although the maleness of the term (which is not its main thrust in Greek or Hebrew) may bother some. However, since "human" does the job quite nicely when used for ordinary people like Ezekiel, perhaps "Son of Humanity" would be a better choice for rendering this important epithet? It at least has more dramatic sweep than other choices I can think of: "Who do people say I, the Son of Humanity, am?" Before closing, there are two other positives about this translation that I'd like to briefly point out. First, the Common English Bible sets off quite a good bit of its text as poetry. We've gotten used to seeing the Psalms and prophetic books of the Old Testament in poetic format, but most English readers may not realize just how much of the Christian Scriptures are also song and poetry. Not only does the CEB bring out the famous songs that Mary and John the Baptist's father Zechariah sang in Luke's first chapter, but also the great hymns to Christ that are almost never printed as verse, in John chapter 1 ("In the beginning was the Word...") and the first chapter of Paul's Letter to the Colossians ("The Son is the image of the invisible God/the one who is first over all creation..."). Even St. Paul's indictment of the Jewish people as sinners just like the rest of humanity (in Letter to the Romans, chapter 2 verses 17 through 24) is cast -- rightly -- in poetic form. The poetry of the early Christian movement, some of which is embedded in the New Testament, helped Jesus' followers memorize their faith. Having it pointed out in modern translations can only be a good trend. Another highly commendable aspect of the Common English Bible is the decision to translate the Apocrypha or "deuterocanonical books." These are considered inspired Old Testament scripture by most of the world's Christians (i.e, the Catholic and Orthodox churches), but you don't need to accept that belief to appreciate having the Apocrypha available. For one thing, these books were included in the Bible translation used most commonly in the first few centuries of the Christian era. If you feel any kinship with your harassed and martyred brothers and sisters of that tumultuous time, you might like to take a peek every so often at their Bible. In addition, these books were late night reading for the likes of Peter and Paul, and you can find allusions to them in their writings (Paul seems to have chapter 13 of the apocryphal Wisdom of Solomon in mind when he writes the first chapter of his Letter to Romans for example). To judge from its New Testament, the Common English Bible is an accurate and enjoyable version using fresh, up-to-date, modern English. There are a few poor translations and other flaws but over all it does a remarkable job of maintaining the delicate balance between fidelity to the original text and understandability to the average Bible reader. I'm open, depending on the content. Unfortunately you didn't leave a way to contact you. Please feel free to send an email to WriteForUs@AuthenticLight.org and I'll get back to you. Very nice review. Thanks. My feeling about the CEB is that is seems somewhat unfinished -- really good in many places, strangely awkward in others, and too literal in yet others. You don't mention the latter issue, and I'd be curious to know your thoughts. In many places the CEB simply seems to repeat traditional Bibllical language when its meaning is no longer understood, or not accurately understood, among typical congregants. A few examples, more or less at random: 1 Cor 1:4 "God's grace that was given to you in Christ Jesus"; what does this mean in modern English? Jn 12:23: "the time has come for the Human One to be glorified" -- so "Son of Man" has to modernized but "glorified" does not? Again, what does "glorified" mean in modern English? Rm 8:2, the whole verse -- completely literal, virtually identical to NRSV, but really a lump of theological terminology all but incomphrehensible to modern ears. Why add "trance" in Rev 1:10 but leave so much else so totally literal? It's hard to see what basis such decisions could have been made on -- so I'm left thinking that the "not literal / not dynamic" philosophy hasn't been fully explicated. But I agree with you, the translators are on the right track in trying to be both modern and literal -- I'm just not clear how it can be done without a slightly weird combination of paraphrase and over-literalness. I agree with you. When I read through the CEB I get the feeling that it needed another pass by the editors. It goes from a truly daring translation like "God's DNA" in the First Letter of John to "We have access by faith into this grace in which we stand through him, and we boast in the hope of God’s glory" (Romans 5.2, my favorite example of turgid prose). There are so many excellent renderings in this Bible, but it's uneven. Someone needs to go through, expand the literalistic translations, get rid of most of the hoary Christian jargon, perhaps reign in a few of the "out there" renderings (like "God's DNA"), and do something about "the Human One." It's not unusual for a new translation to need revising. The New King James and Holman Christian Standard Bibles decided to go through another revision based on reader reaction to preliminary copies of the New Testament. The New Living Translation went through a top to bottom revision right after the entire version was issued in the '90's. They took reader opinion to heart and tightened up on accuracy. My hope is that the CEB team will read all these reviews by readers and make the changes needed to make a very good translation into an excellent one. Agreed - great review... My own preference for "Son of Man" is "Son of Mankind," which is slightly less male-centered than Son of Man. But from my own scanning of CEB Genesis in the past couple days, my take on it is largely the same as yours on the CEB NT -- some wooden phrases, but mostly a nicely readable update written at the 7th grade level. I really need to revise this review now that the complete CEB is out. This was a very helpful review. The scholarship was soemwhat marred by several misuses of the possessive pronoun "its". That's the way it's spelled ... "its." It's = it is. It makes me cringe when I see this common grammatical mistake and unfortunately then I judge the writer as slightly less knowledgeable than he or she probably is. Hilary, did you write "soemwhat" on purpose to drive your point home? :) Thank you for the constructive criticism. That's a mistake I commonly make when I'm writing too fast. Now to go hunt "its". No, like you I wrote too fast. Thanks again for the review. I'm starting a year-through-the-Bible plan from Fourth Pres in Chicago that uses the CEB and it was one of the few translations I didn't have. I was a little wary, especially after reading about "The Human One" at another blog, but your review was more encouraging. Went out to B & N and purchased a copy today so I could get started and not fall behind on the very first day! Hilary, if you're interested you posted the first comment this week making you eligible for a free copy of the Common English Bible if you would like one. Even if don't need a 2nd copy, you could always give this one away. If you'd like it I just need an address to send it to (which I recommend you use my Contact page for so it won't be public). Hope you enjoy the copy you've got! "...a few poor translations and other flaws but over all it does a remarkable job..."
But why do we need another modern English translation? Esp. when we have ones without 'a few poor translations' etc. And Psalms like the 23rd fall flat. Personally, I like their Psalm 23. CEB seems to be the only version that renders adam as "human" throughout almost all of Genesis 2, including 3 uses of "human" in 2:22-23a at the creation of the woman, strongly suggesting that she is other than human. Then after such fairly ruthless consistency, suddenly renders adam as "man" in 2:25. CEB joins some other versions in simply changing Hebrew "him" to "them" in Genesis 1:27b even though it is immediately preceded and followed by Hebrew "them" in 1:26 and 1:27c which indicates the priestly writer's intentionality in using "him" in 1:27b. This juxtaposed suggestion of human plurality in unity parallels the similar suggestion on the divine level indicated by the irregular subject-verb number disagreement in 1:26-27 (Elohim is plural). Further, the Yahwist then demonstrates this human plurality-in-unity through the Eden narrative and the woman's creation, contra Trible's unconvincing androgyny interpretation. Finally, the priestly writer (later editor?) then provides a clear inclusio/bracketing at 5:1-2 that mirrors 1:27, complete with 2 uses of "them" to the apparently intentional "him" (again changed to "them" by CEB and some others). Am I missing something, or is this overwhelming contextual evidence for the inappropriateness of changing Hebrew "him" to "them" in 1:27b and 5:2?